Staying hydrating is an important nutrition strategy that can elevate your performance. Even a mild degree of dehydration can impair exercise performance as well as mental and cognitive performance. The best strategy is to be proactive with your hydration. This means you should begin hydrating upon waking up. Aim to consume about half of your body weight in fluid throughout the day; for example, if you are 170 lbs, aim for 85 fluid ounces per day. But this is only a general rule of thumb – the exact of amount of fluid required will vary based on the type of exercise, duration and intensity of activity, body weight, as well as environmental conditions such as heat, humidity, and altitude. activity. This will allow enough time for absorption. While at practice, you’ll want to maintain hydration levels. This may be challenging because often athletes are so focused on the field that they can easily get distracted and forget to drink. Heat and sun can blunt the thirst mechanism, so you may not even feel thirsty. If an athlete were to wait until he or she felt thirsty, they might already be mildly dehydrated which would be too late! To maximize performance and minimize cramping, aim to hydrate on a schedule to in order to most effectively maintain hydration levels. The best way to determine exactly how much you fluid you need during activity is to weigh yourself before and after practice. Aim to be “weight neutral,” meaning that your weight is the same both before and after practice. If you are losing 2% or more of your body weight after a workout, then you might be at high risk for dehydration and cramping. If this is the case, expect that your performance will suffer. Another way to evaluate hydration is to assess your urine color. Hydrated urine will be pale yellow. Watch out for dark urine which could reflect dehydration. After practice, rehydration is an important aspect of recovery. For every pound lost after practice, you should add 20-24 fl. oz of a sports drink or water to rehydrate. You’ll want to continue hydrating throughout the day in order to properly recover and to ensure you are adequately hydrated for the next day’s practice. Aim for 16 oz of fluid about 2 hours prior. This will allow enough time for absorption. Aim for 6-12 oz of fluid every 15-20 minutes during your workout. For every pound lost after practice, you should add 20-24 fl. oz of a sports drink or water to rehydrate. Another important factor in preventing cramps is sodium. Large amounts of sodium are lost through sweat and should be replaced, especially if you are a heavy sweater or lose a lot of weight throughout your workout. Sodium triggers your thirst mechanism and helps to reduce fluid losses from the urine. In essence, sodium helps to keep you hydrated. Adding sodium into the diet aid in the hydration process, while also prevent the muscles from cramping. If you are experiencing cramping (this could be during or after a workout). If you are practicing on hot sunny day. Add Gatorade, pretzels, pickles, and salty snacks to boost sodium consumption. Taking a salt supplement is usually unnecessary. In addition, adding calcium (as found in dairy products) and potassium (as found in bananas, fruits, and vegetables) may also help to reduce cramping. Aim to drink water or sports drinks before, during and after all activity. Don’t rely on thirst because by then it might be too late! 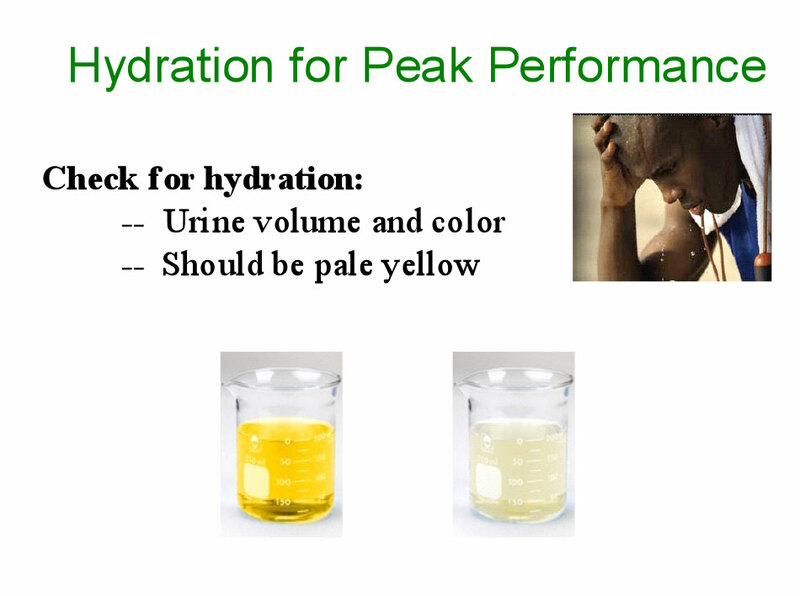 Assess urine color to determine hydration; pale yellow (like lemonade) reflects good hydration, and dark yellow (like apple juice) reflects dehydration. Weigh yourself before and after workouts. For every pound lost, add 20-24 oz of water or a sports drink after a workout. Add sodium from sports drinks, salty foods and snacks. You can also try adding extra calcium from dairy sources (milk, cheese, yogurt) and potassium from fruits and vegetables to reduce cramping.